If you are looking to repaint the interior of your home or office, one of the first things you should take a look at is the condition of your drywall. If you have damaged walls or ceilings and you have noticed cracks, stains, or warped surfaces, you can contact the New London drywall repair contractors at DiNardo Painting for assistance. Our interior house painting professionals are capable of repairing or fully replacing any damages of your drywall, before we refinish the surface with high quality paint, wallpaper, or a custom finish that will suit your style. We are your one-stop shop for all of your interior painting and drywall repair requirements. For the majority of New London area residential and commercial property owners, the sight of damaged or deteriorating drywall can become a nuisance to look at and deal with. 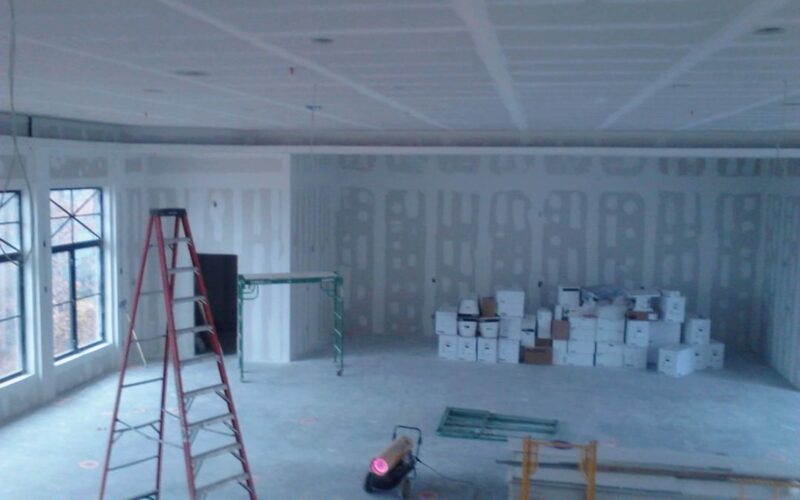 Depending on the area that is damaged, as well as the size and scope of the damaged area, a drywall repair project can be a difficult project to execute successfully. Especially when the damage has occurred in high ceiling areas. Whether you require a single hole repaired, you are are interested in dry-walling a newly constructed room, the drywall repair and installation professionals at DiNardo Painting can assist you. An individual crack or hole in your drywall, can make your home or business appear very deteriorated and unprofessional for your visitors. If you are looking to make a strong first impression, it is imperative that you have the problem fixed immediately. Additionally, if you are in the process of refreshing your home or business by hiring a professional interior painting contractor, it is important that your drywall is repaired in the correct fashion, so the paint will adhere to the surface successfully, and there will be no underlying problems as you move forward with your painting project. If you have a drywall issue, which requires attention, the drywall repair professionals at DiNardo Painting can assist you. We service the New London, Hartford, New Haven County areas and beyond. Contact us today at (860) 961-6280 to schedule your no cost estimate and consultation!